craft "transformation strategies," that are holistic, long-lasting, high-impact and designed to increase downtown economic prosperity. At Georgia Downtowns, we tailor our services to address your unique challenges. We get National Main Street's "transformation strategies" model. We get partnership and collaboration. Georgia Downtowns can work with you to create a great plan, one that is active and realistic (and WON'T sit on the shelf), gather community input that will guide your work plan, and do the work in a way that will inform your leadership and constituency. And, from the get-go, Georgia Downtowns is always available to our partner clients, even after their plans and reports are delivered! It's important to plan the work and work the plan. Creating a dynamic and measurable work plan for your downtown is an essential path to prosperity. We partner with you to build a strategic plan that is project-based and transformative, where resulting strategies for success bring long-lasting and high-impact results. A solid strategic work plan will identify issues, set priorities, lead to community buy-in, build partnerships, foster commitment, and ensure follow through. All of our services begin with a consultation with the client. We meet with the client and his or her partners throughout the process. We then present a proposal that outlines a detailed scope of services and project deliverables, customized for your downtown program. And, from the get-go, Georgia Downtowns is always available to our partner clients, even after your plan and report are delivered. Our full-service strategic planning product is designed for our new Main Street partners. With this service, Georgia Downtowns digs deep to assess the client's needs, program status, and challenges. To do this, we first meet with staff to assess needs and plan the project; then we survey retreat participants and downtown leaders, summarizing results and other available data for participants to use for planning. We work with you to prepare for the retreat. We design, set-up, and then facilitate the board retreat. After its over, we organize and capture meeting information, using it to write an in-depth report that includes a formal strategic work plan, outline of the planning process, set of recommendations, document appendices, and much more. The formal work plan is setup as a pullout section and delivered in the required Georgia Main Street format. GADO 2.0 is our customized strategic planning service; it is designed for those returning clients programs that have participated in our full-service strategic planning and now seek to refresh or update their plans. With this service, Georgia Downtowns will consult with the client, survey participants, design the agenda, and prepare for and facilitate the board retreat. The Main Street program then uses collected information to update the work plan. 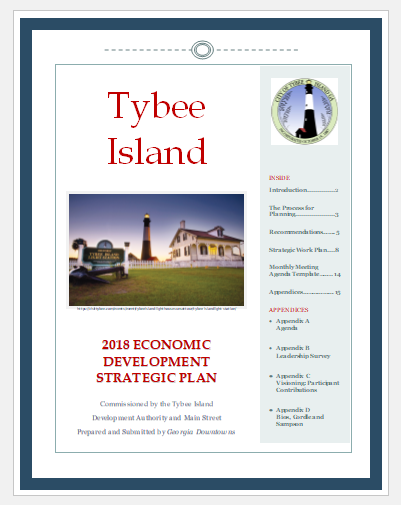 According to the National and Georgia Main Street programs, public input is critical to the strategic planning process for downtown economic development and the new Main Street approach. We can assist you with this important work by planning and facilitating town hall meetings, collecting survey data, holding focus groups, or through the employment of a combination of all three approaches. Community input and market data understanding are key to great plans - we see it time and time again - the more information you have from the community and the potential customer, the stronger and more accepted the plan becomes, freeing your board and you from guesswork and the danger of pet projects taking over the process. We assist property owners and downtowns in locating funding for construction and restoration of historic buildings. Depending on the size of the project, small or large financial incentives can catalyze profitable investments for property owners and result in nicely restored and repaired commercial buildings. Also, downtown lodging is a hot trend and a great amenity for downtowns. We can share options with property owners and downtowns for funding and incentives to make a great project possible. Let's talk. Contact us for a complimentary 30-minute consultation.